Most unusual pair of small side tables, triangle shape with attractive marble tops. The gilded bronze base is highly decorative with a lace design apron holding a small bird on each side of the table. The legs are fine and elegant. The type of table that will be a conversation pieces and can fit anywhere in your home. Unusual pair of Transitional wood inlay side table, night tables, both with compartment and a top drawer. One has a faux leather book exterior. Powder coated metal base with marble tops. 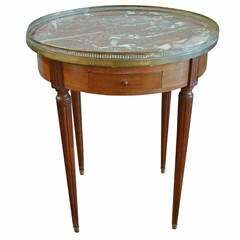 Decorative shagreen and bronze side table. Beautiful flower design. Vintage pair of marble top gallery end tables with tripod base. Pair of contemporary American triangular tubular chrome base side / end tables with "X" for stretchers and top of acid etched goat skin having a faux marble design.